Above: Paul Smith with Laurel May (Mae) print, photo provided by Tracy Smith. 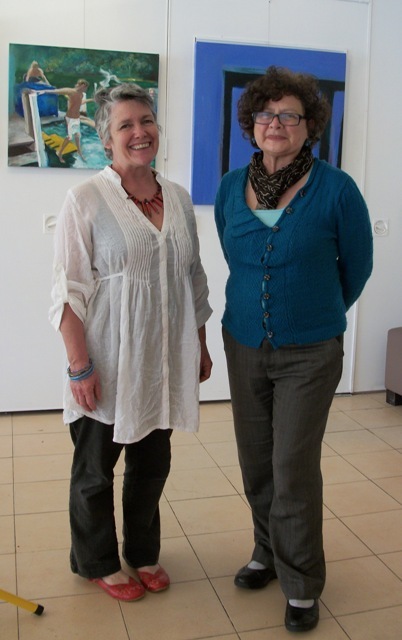 Above: Tracy Smith and Marion Den Driesschen at the Gallery. 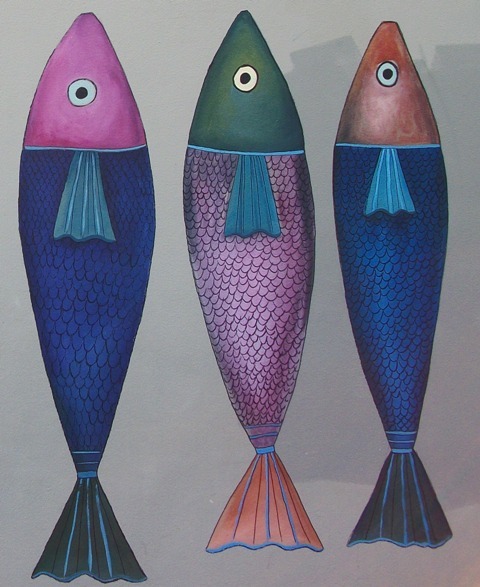 Below: Fish painted on exterior wall of the Gone Fishing entrance by Nettie Lodge. Below: The Gone Fishing Gallery is also a Community Meeting Place; 'after the dog race' kindly provided by Tracy Smith. 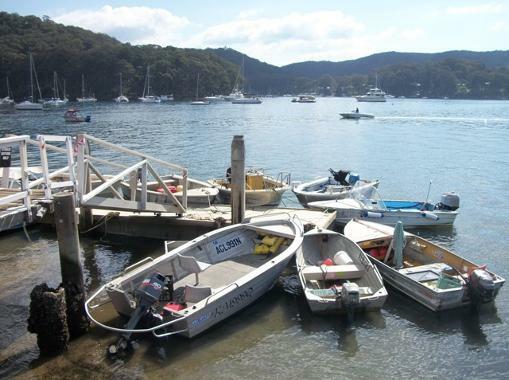 Scotland Island has long been a font of inspiration for many Pittwater residents. Capturing the essence of what it is to live in this beautiful place, tucked away in the estuary where it is surrounded by the hills of the National Park and waters that lap and recede, lap and recede, the air itself seems to foster gazing up and around and attempting to place here, in words and material objects, all this oasis communicates. Community, the annual Christmas Eve Dog Race, ferries that fill the nostrils with salt air and the ears with songs from waterbirds and birds of the bush, people who have a comforting ease in their walk and voices, shimmering edges of summer and blue risen mists in winter, Scotland Island both produces and quells pangs that feel like home. Where may one sip from this font? ; At the waters edge of Church Point you may gaze across, allow what steeps to rise. When you have finished gazing, turn around and there behind you, where the tinnies gather, is also moored the Gone Fishing Gallery. Housed in the former Pasadena restaurant since December 4th 2010, a venue kindly loaned by Mary and Joe Romeo, a group of offshore artists curates, taking turns on a month by month basis as the works are changed, a feast of local creations. Each month a wall shows the works of a Featured Artist. Right: hand carved by Paul Smith, the board outside the aGone Fishing Gallery. 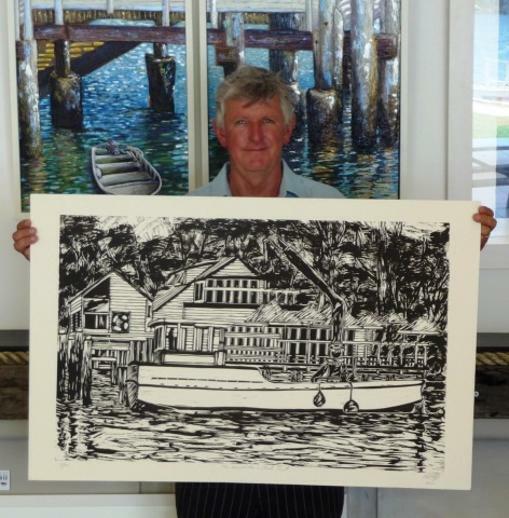 Paul Smith, a master printmaker for over 25 years, who has worked with artists such as Margret Olley, Ben Quilty, Euan Maclead and Arthur and David Boyd, was approached by Mary Romeo to make use of the space and he, in the inclusive spirit of Pittwater and the Offshore community, invited other artists to participate. Curiosity piqued we asked Paul and his bubbly wife Tracy to be our Artists of the Month for September and share some insights on their work. Why did you begin creating, what were your influences? I have been creative as far back as I remember. its not something you develop. Its like having a fifth limb. I guess my earliest influences came from my childhood growing up in Fiji, the rich and bright tropical colours. How did you get into this field, what training did you undertake ? When I left school I went to art college. All I could think about was following my creative drive. My family were not creative in any way and did not fully understand but it didn't stop my need to pursue this path. When I left college I came to Sydney and began working at Sydney College of the Arts. It was there that I learnt the skills as a printmaker. I wrote a book on etching techniques. When I left SCA I set up Warringah Printmakers studio which is still a thriving community space today. I handed this over in order to work as a master printmaker with some of Australia's leading artists. Who are your inspirations or influences? Recently due to the world market and technological advances in digital printing my hand crafted printing business has collapsed. I have now started a community gallery at Church Point; the Gone Fishing Gallery. For the first time in my life I can paint the images I always aspired to but never had the time to; (And) now paint in an almost three dimensional way. The Paintings are three dimensional as I build up a surface of wood which I then carve and sculpt and finish with paint. In the future I would like to make artwork more accessible to most people with an art rental service. I have always loved art. My mother and father encouraged my beginnings and I received my first commission when I was just 8 years old. (it was a friend of mum's and I am still embarrassed to think of it) There is not a day goes by where I don't paint or write. I studied at Alexander Mackie and received my bachelor degree in art teaching. When we moved to Scotland Island 27 years ago Paul and I started to seriously exhibit our work. We helped set up the Island Arts group who have been exhibiting since 1985. I had my first solo exhibition in 1986. In about 2006 I started getting recognition for my work, getting into prestigious exhibitions such as the Blake Prize and Salon des Refuses. In 2008 I won the Fleurieu Peninsular Vista Prize. One of the judges was Betty Churcher, an art historian who I have admired my whole career. Hearing her praise my work to a huge audience of 400 has been one of those moments in my career that left me speechless. Above: MAPPING HISTORIES, Tracy Smith's winning entry. Who are you inspirations or influences? I love to go to galleries and am inspired by primitive and raw art. Art that is expressive speaks about what the artist feels and thinks. Styles too varied to name in a few lines. I also love to research traditional techniques such as fresco, egg tempera etc. The slow grinding of pigment, and fusion of traditional with contemporary is satisfying, it gives me time to contemplate where the work is going. I paint and make sculptures and write about where I live and my life experiences. 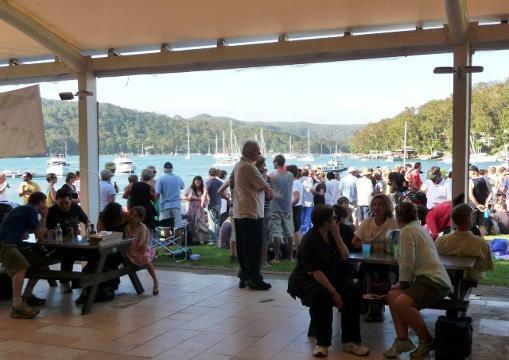 Pittwater obviously features very strongly. I love to get up at dawn and paint the beginnings of the day, full of promise and potential. Every colour, every brush mark, every seemingly accidental mark represents something to me and if they speak to an audience as well then I am satisfied. I just want to keep exploring new ideas and styles. Watermarks, a Bi-annual show in artist’s own studio on Scotland Island and Elvina Bay is on this year, September 24th and 25th.